View More In Cables - Page 2. Start developing your smart home system with the Nexia Home Intelligence Bridge Kit. This starter kit comes with the Nexia Home Bridge, which serves as your Z-Wave hub, and one plug-in Z-Wave dimmer module to get you going. The Nexia Bridge supports up to 230 Z-Wave devices total. To enable remote Internet access, you will need to sign up for a Nexia remote management subscription ($9.99 per month). The subscription includes an online Nexia account that syncs with the Nexia mobile app. With an account, you gain a whole host of automation and management features to customize your smart home system. Your online Nexia account is where the smart home magic happens. Log in through your web browser to add new Z-Wave products to the Bridge, automate events, turn devices On/Off, and more. The app provides a streamlined version of the same controls. The included Schlage Plug-in Dimmer Module adds Z-Wave control to a dimmable incandescent plug-in lamp. Just plug your lamp into the module, and plug the module into a power outlet. The module features two different outlets, one pass-through outlet that always stays powered and one outlet that is Z-Wave controlled. The Z-Wave controlled outlet works with incandescent lights up to 300 Watts. The "always on" outlet supports any plug-in device up to 600 Watts. Installation Details: The Nexia Bridge is easy to set up. 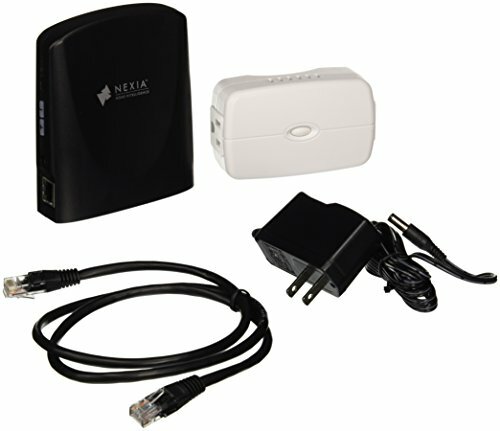 Plug it into a power outlet with the included adapter, and connect it to your router with the included Ethernet cable. The bridge also accepts one 9V battery, so you can move it when adding new Z-Wave devices after the initial installation. Devices are enrolled into the Bridge through your Nexia account. KIT INCLUDES: Nexia Home Intelligence Bridge (BR100); Schlage Home Dimmer Module (RP200RNX); Power Adapter, 110V; 10/100 Ethernet Cable. NOTE: Requires a wireless router and Internet service. Remote access also requires a monthly subscription of $9.99. The Nexia Bridge can hold and control more than 200 Z-Wave products at the same time so you can start small and grow your system as you like. If you have any questions about this product by Nexia, contact us by completing and submitting the form below. If you are looking for a specif part number, please include it with your message.